The host offers a delightful exposition of Turkish cooking. 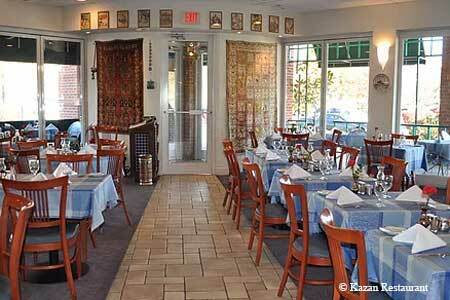 : Though the exotic décor fell victim to a splendid Westernization, the exotic food remains. The imam bayildi (eggplant dish), hummus, and dolma are outstanding, as is the bread, which is tender, supple, and warm. Doner kebab, served only on certain days of the week, is a signature dish; and if you miss that, order instead any of the lamb dishes, either as ground or sliced. Of course, beef, chicken, seafood, and vegetarian dishes are also available, but the lamb is the best bet. Sweets come as an orange baklava (worth waiting for), a thick and rather bland Turkish rice pudding, and the more Western crème caramel and chocolate mousse cake.